WEP started in Baniyatar could not be held regularly due to various reasons. Because of the teachers, not being able to manage the time and the learning mothers¨ laziness towards study, lead to the closing of the classes. We considered the suggestions from the others and asked the old people of new place, dadhikot village of Bhaktapur District, if they were interested in studying. Since they were, we decided to start a class for old people there.The Class is starting from 18th september Everyone are taking the classes with great interest. I asked the principle of the primary school, whom to take as a teacher. 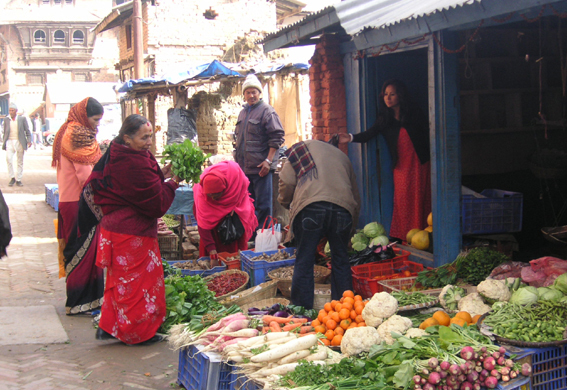 He advised that Subita Thapa, a resident of the place, would be good. 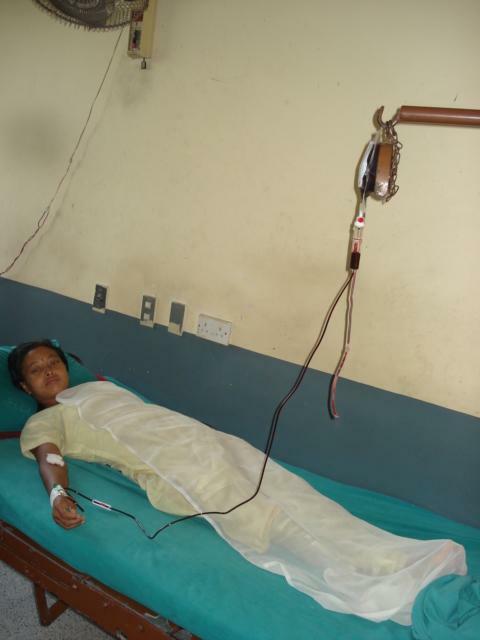 The mother of Subita Thapa had been suffering from typhoid and since she could not get a better treatment, she died when subita was 8 years, and her sister was 6 years. She has financial problems and on top of that she couldn¨t experience the mother¨s love since childhood. Her father married another woman and there is a son from her. Now there are 5 members in the family. of some household matters, her step mother couldn¨t study in childhood so she is also studying in WEP now. Subita¨s father, Nabraj Thapa had gone to Malaysia a year ago, with the hope to overcome their financial problems. He does labourwork, but still he is not able to earn a good amount of money, so they are still facing poverty. Her mother(Step mother) works in others¨ field and during festivals, she prepares flowers¨ garland・・・・), to manage the family expenses and pay for the students¨ fees. Subita is also engaged in preparing flowers¨ garland as well as knitting. She is studying graduation course and supporting her mother side by side. 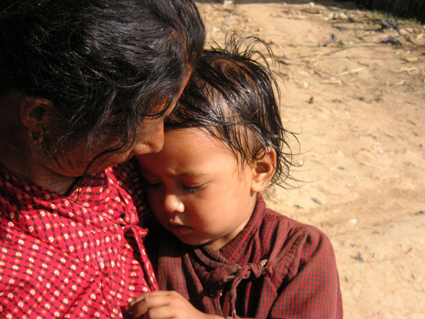 Usually in Nepal, the step children are abused and hated. But it¨s completely different in Subita¨s family. Even though they are poor, they are always smiling and sharing happiness, not always exposing their grief, which really impressed me. Sunita was searching for something to do as job as there are no other sources of income. So we took her as a teacher. Q. why did you come for the classes? ┴ Because I wanted to study. Answers from 5 women. Q. for how long do you want to study? Q. what you used to do at this time before joining these classes? Q. why didn¨t you study when you were young? Q. do you study only here or at home as well? Q. how do you find these 1 and half hours of study class? Q. does your family support you for study? Q. how do you mange time for home and this class? The conversation with the teacher. Q. the parents want their children to study well and be a great person but How do you feel to teach those parents now? Ans . the woman of the house has a great role in making the family managed. If she is educated then, whole family can be educated. So I hope to make them educated to help them make their family educated. Q. how do you feel while teaching old people? Ans. it¨s fun to teach them. It¨s good to know that they are interested. Even they are happy that they can now study. I¨m very glad to teach them because they have a great desire for study. Q. how long can you mange to teach them? Ans. I want to teach them till the time they want to study. Women have been regarded only as someone’s daughter before marriage and wife and mother after marriage since the past. This kind of thinking against women has been changing according to the time but has not be completely changed yet. Women were looked as “someone who will get married someday and go to other’s house” since many years. As a result, they were brought up in the family in such a way that they can do all the household works and become good bride and wife in the future. So the parents did not feel important to send them to school and educate them. Instead they used to help their mothers in household works and look after their small siblings. In the past, parents used to think that “if we educate daughters, they will elope away”. So they feared this as arrange marriage was an ideal marriage during that time. Even now, when we go to the rural areas of Nepal, parents still have this kind of thinking which has resulted to more number of girls who still can not go to school. In Hinduism, women have higher status. However in reality, it is different. During menstruation period, women are treated as unclean and are not allowed to touch goods especially in the kitchen, and the goods touched by them are treated as unclean and are not eaten by other people in the family especially by men. Further, women in some communities have to stay alone in a dark room for about 5 days during the period. They are not allowed to go to the temple during this period. During important religious activities like funeral service, etc. men play the vital role. 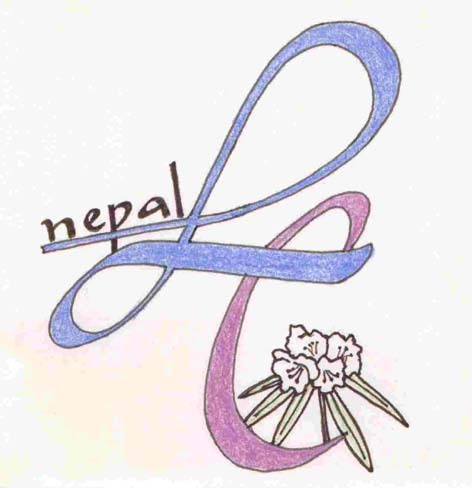 From various researches, it has been found that women in Nepal works for longer hours than men but their income is less than men. Women have to spend their time in household activities and are busy taking care of their children in home. Men work outside and have no worries about household works and child care in compared to women. Men have greater opportunities to go to school since their childhood and are thus more educated than women. Therefore men can easily get job in compared to women since they are more educated and have no burden of housework and child rearing. Thus, if women do not get opportunities for education, they will not be able to get good job and become economically independent. This will always put them in lower status in the society. Therefore it is necessary to change the prejudicial way of thinking against women and educate them from childhood. This will encourage them to get a good job and earn themselves which will finally help in making their status better in the society.